Cross Plant Hire is a new name to the market however we have been providing cutting edge construction, motorway and agricultural solutions for over 35 years. Over this time, our business has based its operations on continuous quality improvement as well as the ability to provide cost-effective options for every customer. There are nonetheless times when unexpected events can have a lasting impact upon the operations of every business. During the overnight hours of 23 February, our plant and an adjoining structure were involved in a fire. Thankfully, the efficient responses of Ramsbottom and Lancashire fire services limited any damage and we were conducting operations the very next day. How has this incident served to reshape our approaches and what traits have we continued to exhibit? Since this time, we have developed a modern and innovative on-site workshop. We are therefore able to meet and exceed the demands of every customer. The bottom line is that we adopted a proactive approach and viewed the fire as an opportunity as opposed to a logistical setback. This is the same perspective that we always taken since our inception and our team of dedicated professionals would never let a fire hold them back. In the same respect, we were committed to providing our customers with the reliable services that they have come to expect from Cross Plant Hire. Cross Plant Hire fully understands that experience and professionalism are obtained just as much from obstacles as they are the results of dependability. This recent fire highlighted our capability to move forward and to leverage the tools at our disposal. We take a great deal of pride in offering services 24 hours a day and seven days a week. Allowing a fire to impede these services was simply not a possibility for our staff. * Adjustable wheel wash systems. The bottom line is that we appreciate the impact that these talents have upon the business community. Clients have come to rely upon our sense of reliability as well as the fact that representatives can be contacted when they are needed the most. Therefore, the February fire only served to increase our focus towards providing superior services that rise above and beyond the competition. There is no doubt that any business-related fire can represent a temporary setback. However, this observation is truly in the eye of the beholder. While some firms may have allowed such an incident to adversely affect their operations, the exact opposite is true in regards to Cross Plant Hire. As our techniques continue to evolve, clients can expect the very same levels of service as in the past. In order to learn more about what we can provide to you and your firm, please use our online contact form. 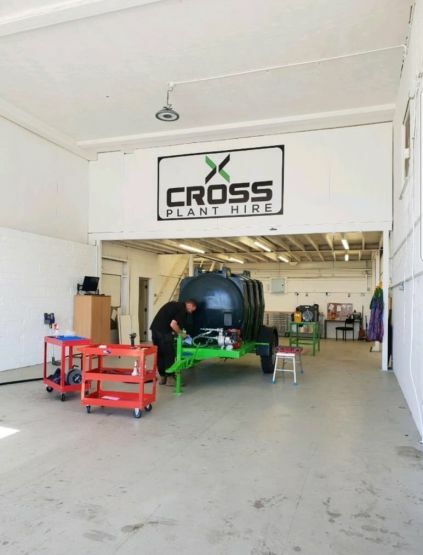 After the recent fire, Cross Plant Hire is back and better than ever.